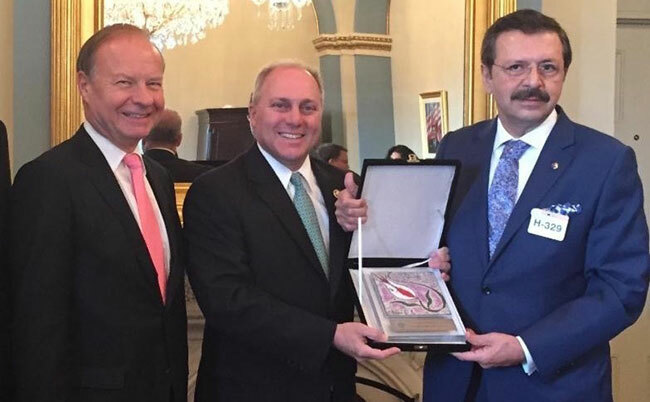 House Majority Whip Steve Scalise (center) with TCA President G. Lincoln McCurdy (left) and Union of Chambers and Commodity Exchange of Turkey (TOBB) President Rifat Hisarcikoglu in the U.S. Capitol, September 2015. TCA extends wishes of a speedy and full recovery to House Majority Whip Steve Scalise (R-LA/1st) and the other individuals who were shot at the tragic shooting in Alexandria, VA on June 14, 2017. As a member of the Congressional Caucus on U.S.-Turkey Relations and Turkish Americans, Majority Whip Scalise is a supporter of the Turkish American community, not only in Louisiana but across the country.